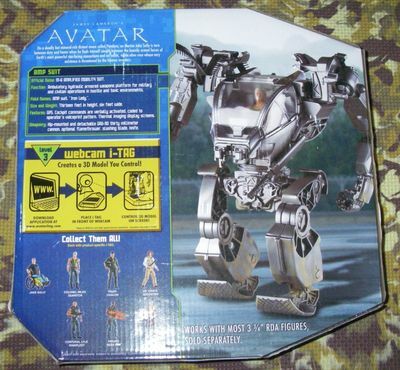 This is the mecha suit from the movie Avatar, sized to fit 3-3/4" action figures. Whatever one thinks of Mr. Cameron’s limitations in plot and character development, he certainly has a good eye for appealing visual designs. The box is an odd shape, being cut to create additional flaps that are secured with an annoying combination of both glue and tape. 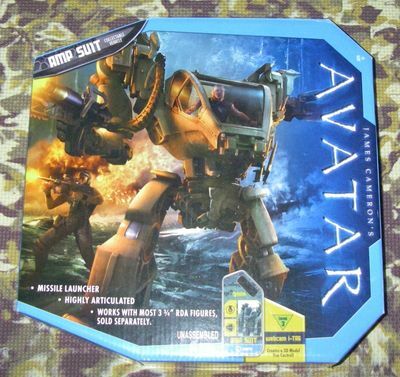 The box art is appealing, with an action painting on the front and a reasonably representative photograph of the AMP suit on the back. The latter is necessary since the box does not allow one to see the actual toy er.., uh.., collectible vehicle. The reason for this becomes clear when the box is opened, as the suit comes disassembled in its major components, each sealed in its own plastic bag and separated by cardboard dividers. At least there are no twist-ties to be found. The box also includes some background information on the AMP suit, describes the I-tag feature, and shows several figures in the series that are suitable for use operating the AMP. 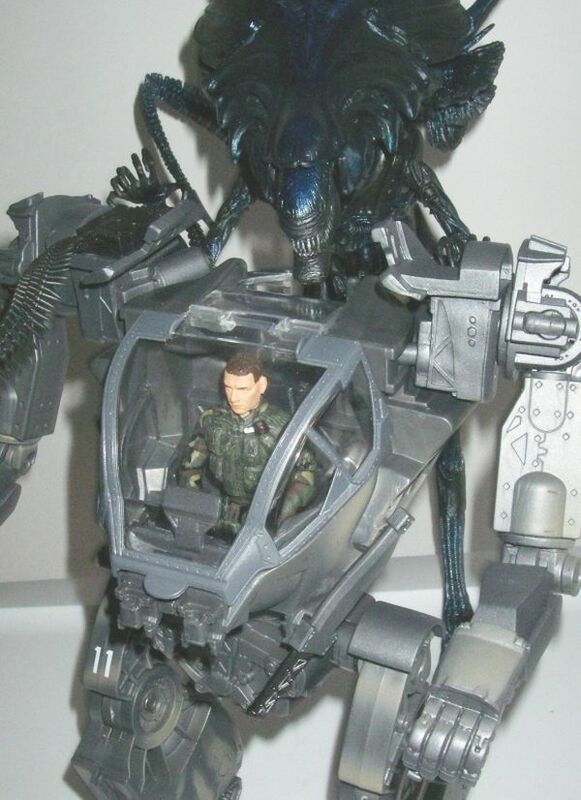 The appearance of the overall mecha looks pretty close to me to the one in the film, with a reasonable amount of detail for a toy. The seams between the halves of the limb pieces are rather noticeable, but thankfully there are no limb segments that are hollow on one side when they shouldn’t be. The cockpit detail is a bit soft, but would be greatly improved if one were to take the time to paint it. The overall mechanical detail is rather flat, which is most notable in the hip-abdomen area where the mechanical linkages for the legs look more like molded-on surface greeblies (because they are). The copyright and “Made In China” (surprise, surprise) notices molded into the back of the main body could have been placed somewhere less conspicuous. I’m not really sure whether this fits under sculpt, but mention should be made somewhere that the suit will happily fit the average a 3-3/4" action figure. The key to getting the figure in is to COMPLETELY IGNORE the misleading picture in the instructions that shows the figure in a sitting position. The figure should stand in the suit, with the feet extending down into the abdomen section. The suit should fit most human or roughly humanoid figures that do not have their legs splayed out too much. The figure shown is a helicopter pilot from BBI’s Elite Force. 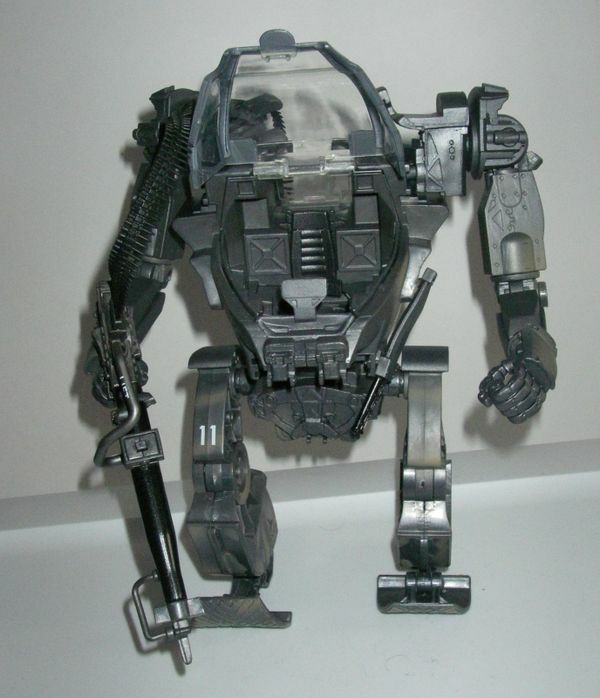 The mecha is molded in silver plastic with tan paint applied over it, although it is not clear whether this is supposed to represent weathering or camouflage. The exposed plastic does not look too bad, except for some of the joints (the knees in particular) where the discolored spots resulting from snipping the parts off the sprues are evident (and were apparently airbrushed or otherwise covered in the box photo). The overall appearance is unobjectionable, neither detracting nor adding much to the figure. Again, the cockpit interior is unpainted, leaving it looking rather sparse. 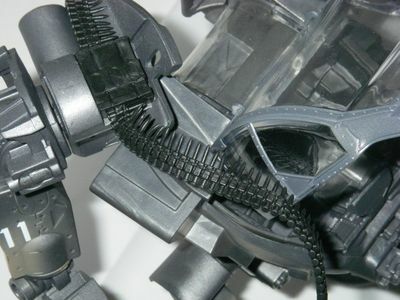 One notable weak spot is the unpainted ammo belt and the plastic guide piece that holds it to the shoulder; both are molded in black and look out of place against the remainder of the suit. The best of the painting is on the canopy, where the color of the window framing is solid and sharply defined. Combined with the crystal clear plastic used for the windows, this piece looks very good. The leg articulation is moderately good, the arm articulation less so. The legs have pivot joints at the hip (not a ball joint hip as shown on the instruction sheet, apparently referencing an earlier prototype), knee, ankle, and mid-foot. The mid-foot joint is particularly welcome, although the figure still has trouble holding many poses. The reason for the low score is that, as the suit came, the plug for the hip pivot was screwed into the leg too tightly and would not rotate. This was remedied by loosening the plug with a Phillips-head screwdriver, but it was tricky to get the piece adjusted so that it would rotate but still be tight enough to avoid floppiness. This may take some trial and error, and may need readjustment if it loosens over time. Hence, the recommendation above to avoid letting those lugs become locked into the socket piece on the hip. The other joints are thankfully well balanced between ease of motion and ability to hold in place. 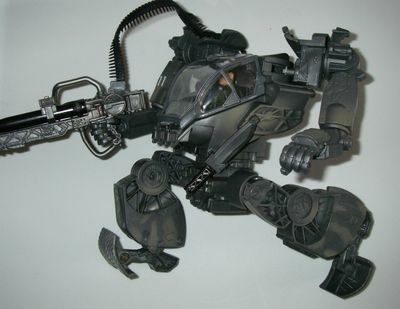 The balance of the suit is not the greatest, and the range of poses in which the mecha can stand is much less than the range of articulation allows. The arms suffered a similar, but different problem. Here the arm is apparently not supposed to rotate about the plug on the body, but on one side the plug was mounted at an incorrect angle (the hexagonal plug should have parallel faces extending vertically). This was again fixed with the screwdriver. The arms have an odd (and rather wobbly) sliding motion along a track that extends towards the back of the neck, a shoulder pivot to raise or lower the arm, and axial rotation just above the elbow and at the wrist. A pivot joint to change the angle of the elbow is notably lacking, and would have given a much better range of motion. The arm joints are tight enough to hold up the weight of the gun in a desired pose. The body swivels at the hip, and the canopy raises and lowers, having a ledge that locks it in the raised position. As accessories, I am counting the gun and the knife, although these are really part of the suit and modification would be needed to remove either the ammo feed for the gun or the sheath for the knife. The low rating is due to the fact that neither weapon can be firmly grasped by the hands. The gun is floppy, but can at least be held in the grip, unlike the knife, which can only be loosely rested in the grip. The knife fits snuggly into the sheath, and should probably stay there. Also bringing the rating down is the ammo belt for the gun which is molded in a soft, rubbery plastic that comes warped so that many of the bullets are visibly bent. One end of the belt presses into a recess on the gun, the other into a recess on the back of the body; both fits are tight enough to stay in place. The gun has a missile-firing capability that adds nothing of value to the toy. Only a single missile is provided, molded in silvery grey rather than the usual bright red. However, loss is unlikely as the anemic spring selected by Mattel’s liability attorneys will not shoot it very far. An accessory which I did not use is the plastic I-tag that can be scanned by one’s computer camera to allow access to a 3D model of the suit. Not wanting to download and install however many MB of required software, I chose not to evaluate this feature. I suspect that, much like the Comm-tech chips from the Episode I Star Wars figures, this add-on will not add much value for most collectors. This rating assumes that one get the suit for something in the $15 range on sale or via eBay, not the full $25 price. 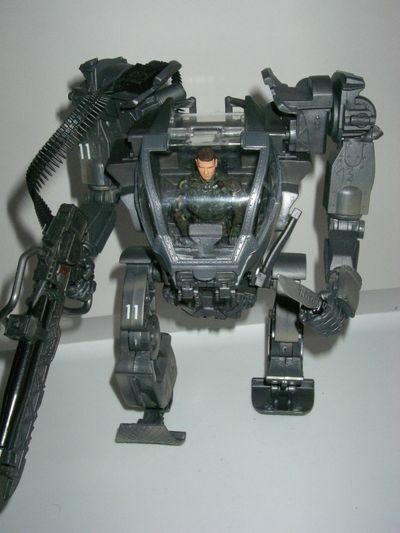 Once the joint issue is overcome, it is a reasonably good-looking suit, with a fair degree of articulation, and fulfills a “need” as there are not many good looking mecha available for 3-3/4" figures. 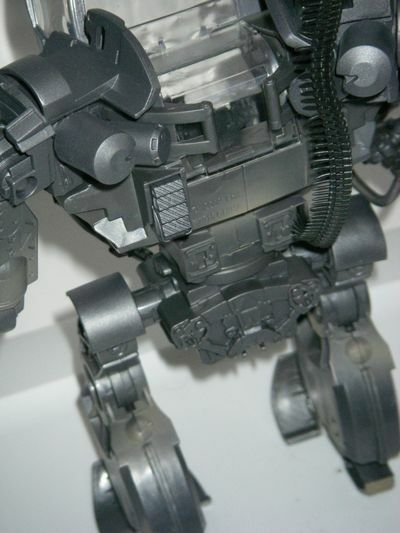 It should serve to placate collectors somewhat until that happy day Hot Toys sees fit to issue a 1:18 Powerloader. Once the problems with the joints are corrected, this would seem to be a fun toy, and appears sufficiently durable to withstand reasonably careful play. As a toy, the difficulty getting it to stand up should not be as great a concern as if one wants it to look good on a shelf. 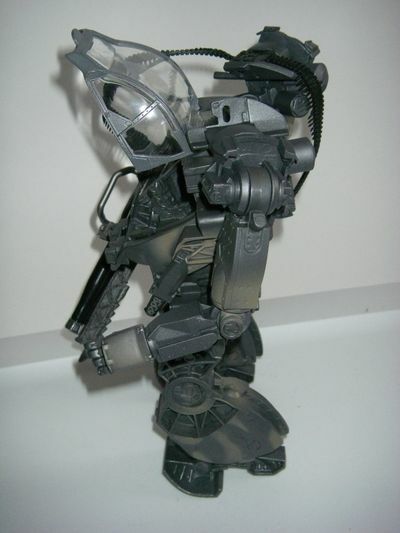 The ability to accept most standing 3-3/4" action figures allows the mecha to be used with a wide range of figures. The canopy ledge that holds it in the raised position may or may not be subject to wear or breakage after being raised and lowered over time, and likely the windows will get scratched well before that. Not the greatest, but a reasonably good figure despite the flaws, managing to capture the appealing mecha design from the movie. This product was purcahsed for the review by the reviewer. Photos and text by Jeff Semprebon.